Yet another kid favorite recipe from Simple Sumptuous Cooking! I intended to make some extra servings of this dish to serve more than just one meal, but it was too tasty to last more than 10 minutes on the table. That’s how well the kids liked it! Although it looks like pasta with marinara sauce, this is quite different. In fact, is as creamy as you can imagine. 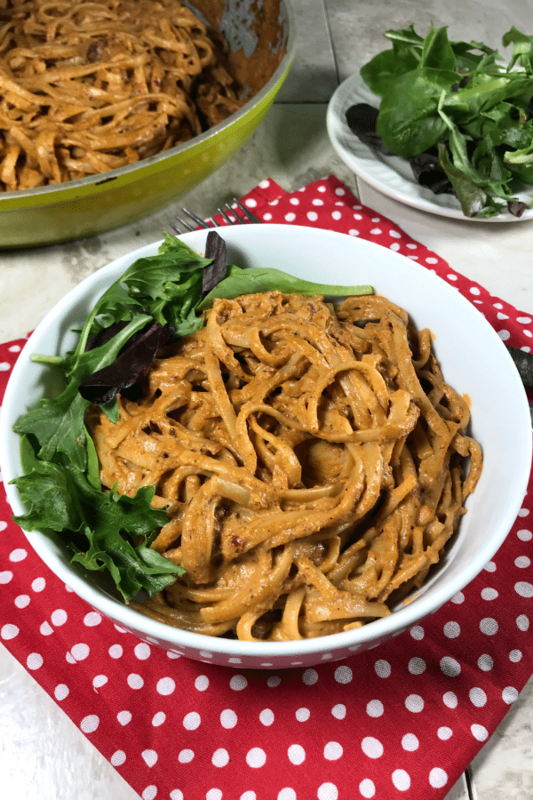 The creamy sun-dried tomato pasta sauce is made from scratch using plant-based milk, sun-dried tomatoes, soaked cashews, and salt. My family has always been a huge fan of pasta as long as the sauce is flavorful. It does not have to be too spicy, but it can never be without flavors from tomatoes and vegetables. 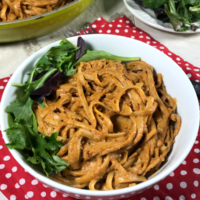 If you are like me try the other pasta recipe that I shared in the past…Masala Pasta. I bought the Costco version of sun-dried tomatoes that come marinated in olive oil. So you can imagine that I have plenty of sun-dried tomatoes to make the sauce. First off, you have to strain the sun-dried tomatoes from oil and blend with soaked cashews and your choice of plant-based milk with a hint of pink salt. It is as simple as that to prepare the sauce. When you are ready with your favorite kind of pasta. Toss it over and add some spices, vegetables. Feel free to increase the number of spices for this recipe: basil, red pepper flakes, paprika. This will make the sun-dried tomato sauce even more flavorful! For this recipe, you can use any kind of pasta. 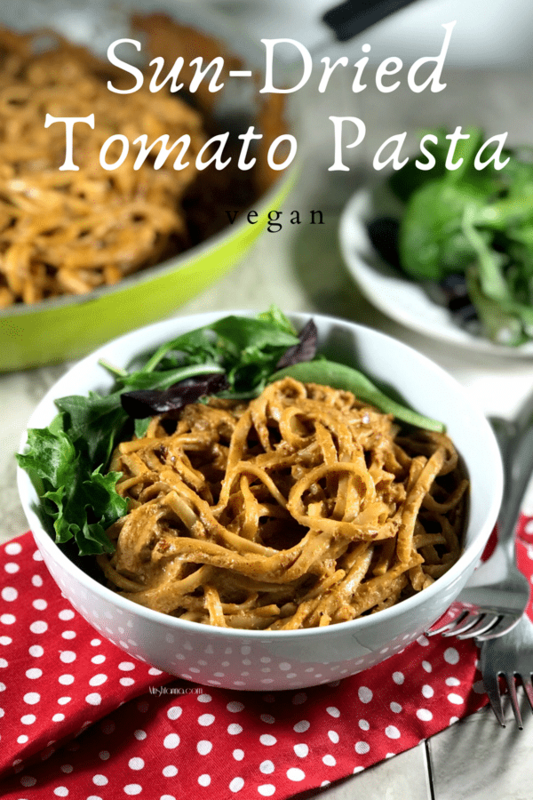 For this recipe, I had used linguine whole grain pasta that comes with excellent source fibers. Penne Pasta works well too as it packs more flavor from the sauce in every bite. You can use any type sun-dried tomatoes, I used “Tassos” brand from Costco. This version comes marinated with Olive oil. Just be sure to strain the tomatoes from all oil before you blend them. If you have the time and patience to sun dry tomatoes, that would be the best option for this. But let us be realistic…If your version does not come marinated with Olive oil, just use 2 tablespoons of Olive oil when you prepare the sauce. I am interested to hear from you if you liked this recipe. Please try this today and share your thoughts here or on my facebook page. For more delicious vegan recipes such as this sent directly to your inbox, just subscribe to my newsletter. You will also get a copy of my e-book where I have put together some simple vegan dessert recipes and dessert essentials. My readers have found it very helpful and I am hoping you will too! Here are the sun-dried tomato pasta recipe details. 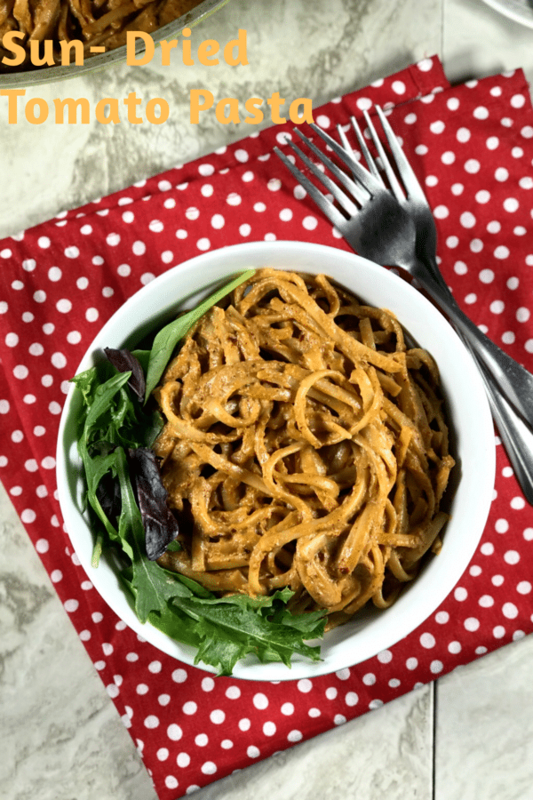 The creamy sun-dried tomato pasta sauce is made from scratch using plant-based milk, soaked cashews, and salt. Soak the Cashews for 10 mins in warm water and set them aside. Cook the pasta as per the instructions mentioned in the pasta box. Blend the soaked cashews, strained sun-dried tomatoes and almond milk or any type of plant-based milk. Make it into a smooth and creamy sauce. Place a large skillet on medium heat and heat the oil strained from sun-dried tomatoes. As it heats up, add red pepper, black pepper, and oregano and saute for 20 sec. Now, add the blended sauce and salt. If the sauce is too thick add little water and cook for another 2 mins to bring it to a boil. Take it off the heat and add the cooked pasta. Toss the pasta gently until you get good coverage of the pasta sauce. Garnish with Basil leaves and pepper flakes to suit your taste. Sun Dried Tomatoes Pasta is ready to be served hot!